I started college as a fine arts major. I was in choir and numerous plays. I attended the Interlochen Fine Arts Camp in Northern Michigan, attended college locally as a fine arts student while I was in my senior year of high school. I sang in the Flint Festival Chorus and had the honor of singing with them at Charles Stewart Mott’s funeral. I was in Gilbert and Sullivan Players, and the list goes on. I had many friends who were gay; it never bothered me. And why should it? A number of years ago, my husband and I and our two sons attended a different church than we do now. The priest at that church said to the congregation (during a Sunday service), that he would not serve communion to any individual that he knew to be homosexual. That made me extremely angry, and I went home in tears. You see, my close friend Chris was active in his own church in high school. He spent a lot of time helping the youth in his church, assisting the regular Sunday School teachers as needed. He spoke freely about his faith in and out of school, and you couldn’t find a more devoted Christian. And yet, if he were to attend my church, he would not have been allowed to receive communion. In my eyes, that was just plain WRONG. Fast forward to the late 1970’s and early 80’s. I was a young mother and just starting to learn how to quilt. I was self-taught and could not find a quilting class, but had the pleasure of working at Quilts, Kits and Caboodles, a quilt store in downtown Flint, Michigan. There, I picked up some tips and suggestions, and I was off and running. Within a year or so, I started teaching quilting in the Flushing School District, one night each week, in their community education programs. In my first class was a young man about my age who really wanted to learn how to quilt. I thought that it was unique for a man to want to learn how to quilt, but why shouldn’t he? I didn’t blink an eye, though looking back, I’m sure there were a few women in the group who might have had questions about why James was there. Fortunately, they never brought up the subject. 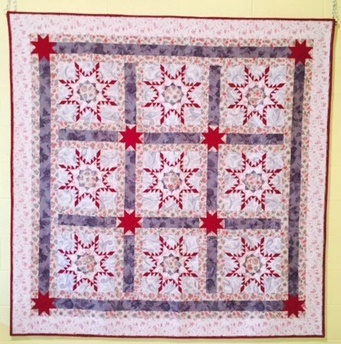 A couple of years ago, I joined a quilt guild in our area. It was interesting to meet with others who loved quilting, though I am a hand quilter and most everyone else was not. Several older women chastised me for not using a machine, but beyond that, everyone was fine (most of the time.) I spent a year as president of the guild, and helping to bring in speakers and to plan programs. I did a trunk show with my own quilts, showing the group quilts from the two quilt books I had written early on. There was a man who attended that trunk show, the only man in the group. I was thrilled to see him there, as James was the young man in my first quilting class years ago (mentioned above.) What surprised me was the reaction of the others in the audience who wondered just why he was there. After all, wasn’t this a WOMEN’s guild? No, it was a QUILT GUILD. Gender was never a deciding factor for attendance, and I made that clear. From that time on, the atmosphere within the group changed. I brought in a fantastic male speaker Several other men started visiting the guild on a regular basis to learn how to quilt, but they were treated differently. And because I was friends with several of them, I noticed that I, too, was being treated differently. One person in particular became very nasty with me, and I was never sure just what brought that on, but I looked at it as her problem and not mine. The group is a small, SECRET group on Facebook. You can’t find them by doing a search, you have to know how to access the group. I don’t care to know how that is done, as I want no part of it. So why am I writing this blog post? Because quilters need to know what is going on. We thought that quilting was a safe, fun, relaxing hobby, something pleasurable to do in your free time. It COULD be that, but now our world is a lot more complex than it was before. When I first saw the name “Conservative Quilters,” I thought that meant quilters who are careful in planning their quilts, rationing out fabric, using up scraps, etc. Nope, not that at all. I am seeing several of my friends being attacked. And, this past week when I mentioned it in a Facebook group that I started several years ago, the nastiness ran rampant in ways I would never have imagined. And it is just SO wrong! I have been deep in thought the past couple of days. I decided that I am not going to do anything different, but I AM going to be supportive to my quilting friends who are being attacked. I’m not going to name any names. I’m not going to add fuel to the fire. But I do know this: I hope these so called “Conservative Quilters” who hold themselves up as being devout Christians will come to the realization someday that Christians DO NOT ACT LIKE THAT. THEY DO NOT BULLY OTHERS. THEY DO NOT CALL PEOPLE NAMES AND RUIN THEIR BUSINESSES. That is not why God Sent His Only Son. Pick up a bible some day and stick your nose in it. Do some reading. I will be praying for you.